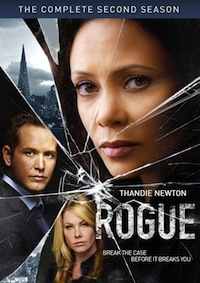 ROGUE is returning to DirecTV for its second season tonight, but many things have changed. The show will still be centered around Thandie Newton’s Grace, but she has a new job as a handler for the FBI, and she’s surrounded by a new group of people — some good, some…not so much. One of the show’s new additions is Ethan (played by Cole Hauser), a former solider whose primary group of associates are the men he fought with in the war. And, naturally, one of the men in Ethan’s group is the target of Grace’s investigation. Season premiere: Season two of the DirecTV original series will see Grace attempt to navigate a new life. But things can’t stay quiet for long. Separated from her husband, she is committed to providing a stable home for her daughter Evie (Sarah Jeffries), but those plans are thwarted by the unexpected arrival of her estranged mother Vivian (Clare Higgins). Professionally, Grace has taken a job as a handler for an FBI Task Force investigating the shadowy world of corporate espionage in San Francisco. But when her undercover operative Sarah (Aleksa Palladino) goes missing, Grace is forced to return to the life she so vehemently renounced.